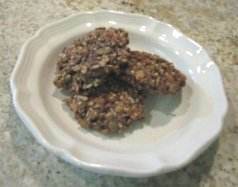 This is an all around tasty and healthy snack treat. Not intended to be fed as the main part of a diet. A small amount is put in my cage or on my play stand. It can also be tucked away inside foraging toys. 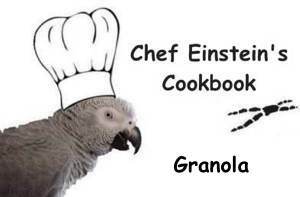 This recipe is only a guide as the ingredients can vary according to what is favored by your birdies. 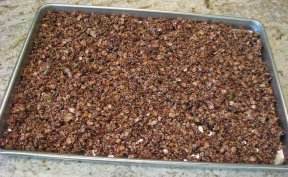 The granola can also be made into logs, bars, or cookies. 1/2 cup unsalted (raw) mixed nuts (pecans, almonds, walnuts, etc.) Place in a medium bowl. 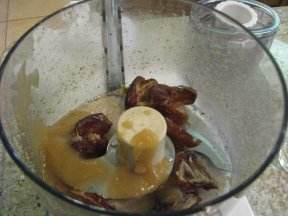 Step #2: Combine in a food processor, blend until smooth. 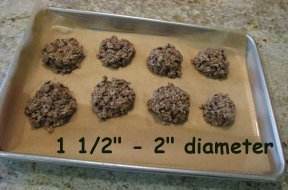 Bake in a preheated 350 degree oven for 20 minutes. Stir mixture every 5-7 minutes. Keep an eye on it so the mixture doesn't burn. 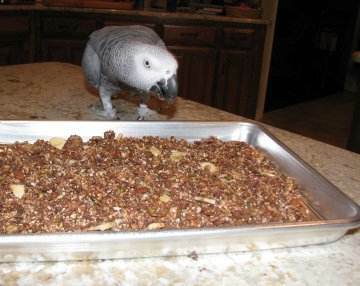 Let cool and let birdie enjoy as a treat! 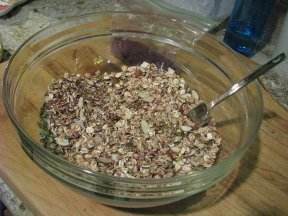 Step #1: Mixture of 5 grain rolled hot cereal, nuts and seeds. 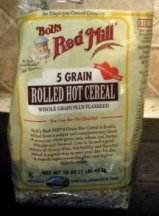 Bob's Red Mill 5 grain rolled hot cereal. Step #2: Process dates, apple sauce and coconut oil. 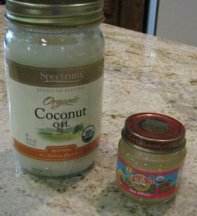 Coconut oil and Apple Sauce. Mix and form into shapes and bake. Let cool and enjoy as a treat!